In early active alopecia areata, the hair cycle is disrupted and there is an abnormal shift in the expected ratio of growing, resting and shedding (anagen, telogen and catagen) hair follicles. Short, 1 to 2-mm fractured hairs can frequently be seen at the active margins of alopecia areata. These hairs are commonly described by the clinician as exclamation-mark hair. Some people with alopecia areata may experience changes in hair colour during, or after, an episode of hair loss and at times these colour changes can be permanent. The phenomena that pigmented hairs are more frequently affected by alopecia areata and that re-growing hair is often initially white are still not explained scientifically. Anywhere between 10% and 66% of people with alopecia areata also have aberrant nail formation. Nail abnormalities can precede, follow or occur concurrently with hair loss. 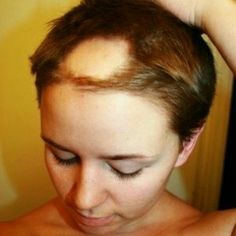 Alopecia areata commonly affects pigmented hairs and is less able to attack un-pigmented or white hairs. Alopecia areata runs an unpredictable course and may last many years with some re-growth, or it may cycle through expression and remission. In some cases, it may only last for a short period and normal hair growth can be quickly re- established within months.